I can remember as a kid how exciting it would be when the catalogs started arriving. Outside was cold and snowy. Inside we were dreaming of what flowers and vegetables we would plant in the garden that year. No doubt in 1893, families had the same dreams when they received their copy of the River Raisin Valley Nursery catalog. Granted, I’m not sure this simple tulip drawing would be as tempting as the full-color glossy magazines of my childhood. But, it was one of several flower drawings that accompanied the catalog from River Raisin. It’s a simple engraving, so it’s a black and white line drawing. 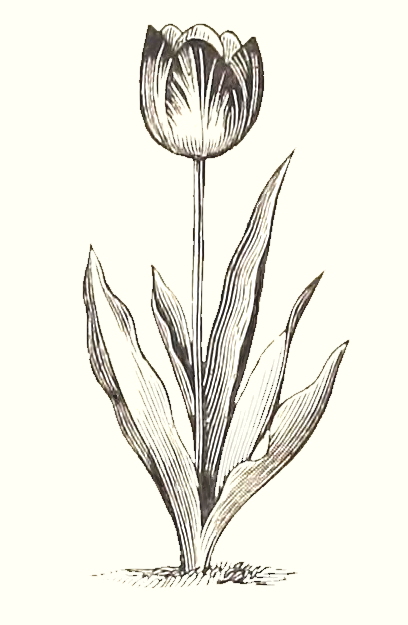 How much fun would it be to take this simple tulip drawing and add your own artistic touches? The catalog included a second tulip drawing. Maybe the Tulip Engraving will meet your needs better. Or you could use them together for even more impact.